Online ticket sales are now closed. Tickets may be purchased at the door. 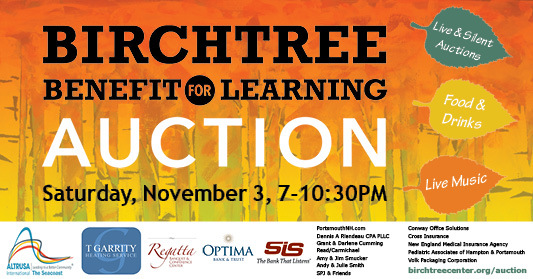 Proceeds benefit the nonprofit Birchtree Center's autism programs. Note: This is an adults-only event. For a list of auction and raffle prizes, click here. To see photos of selected auction items, check out our Facebook page. *The Wish List admission price is available to anyone who donates three or more items from Birchtree's Wish List at the door. Reserve your raffle tickets now and your raffle tickets will be waiting for you at the door of the event, filled out and ready for you to select your favorite prizes! Or, if you prefer, we can simply enter ALL your tickets into the drawing for an iPad Mini 4. How should we deliver your raffle tickets to you? I'm attending the auction and will pick up my tickets at the raffle table. Please enter all my tickets into the drawing for an iPad Mini 4. Your donation to The Birchtree Center is tax deductible to the fullest extent allowed by law. $250 - Underwrites a month of gym & pool memberships for 20+ Birchtree students--developing life-long healthy exercise habits. $100 - Funds a classroom trip to the grocery store--purchasing ingredients for classroom cooking lessons. $50 - Allows a family living with autism to attend an admission-free Autism Workshop--with complimentary special-needs childcare.